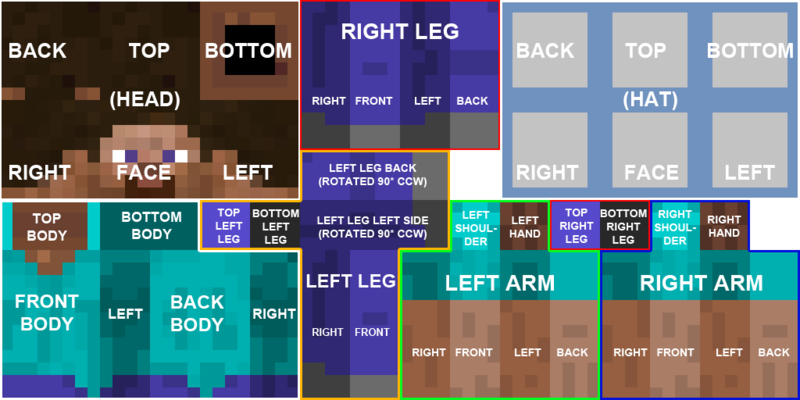 Snapshot 14w3b introduces the ability to texture both arms and legs! It also gives every other body part an extra 3D layer similar to the hat layer in the original skin! Awesome! These new extra layers are covered up by Armor, just like the hat area. The new skin file uses a 64x64 layout with the old skin at the top and the optional overlays in the bottom half. Old 64x32 skins are still supported without modification. However... this addition will not apply to similarly shaped mobs (zombies, zombie pigmen, etc) and it doesn't work on armor. Whether these things will change in the future is anyone's guess. What follows is the original post, while I decide if I should further modify it to try and push for the other mobs/armors to have asymmetrical textures. Either way, this is a huge victory! We've no plans to touch skins right now (except to fix them... the skin server is really unstable) but we're rewriting the whole rendering stuffs and maybe we can consider looking at this then, when it all becomes much easier. Basically saying "maybe" in the future. The important part is that Mojang is aware of the suggestion and was moved enough to respond to the topic! I am forever amazed with how much detail minecrafters have been able to squeeze out of the extremely limited space provided by the game's textures. Skins especially are quite a challenge due to being confined to a 64x32 pixel size. And yet there are many, many examples of beautiful and amazing skins out there that make the most of this limited space. And yet, it could be possible to grant everyone a little more... to be blunt, the current skin texture for the player character has a lot of unused and wasted space. For those counting, there are 480 unused pixels in the texture (out of a total of 2048). + keeps all sections grouped together in a fairly intuitive way. There are hundreds of thousands of skins floating out there on the net. It is not reasonable to expect all of them to be updated or converted. Remember when they flipped the direction of the bottom-head/hat texture areas on the skins? There are still countless skins out there that haven't been fixed. This is a major change so it can't simply be done and let all the current content out there suddenly break. There will be backlash. On top of that, more recently the Minecraft Launcher has been augmented to allow easy access to older versions of the game - versions which absolutely expect the player skin to be using the old format. Finally, there is no reliable way to program the game to detect the different kind of skin formats based only on areas of the skin file that appear to be used. This is because the skins often have extra content in the "unused" areas. This content could be in the form of an author's name/logo, bleed off from the main image, or pixels used by specific mods on the skin. Bottom line, we need to have a simple way for the game to know how to differentiate between the old and new player skin formats so both may be used at the same time by different players. Note that this problem only affects player skins. Mobs and armors are always controlled by the local texture pack, so there is no need to support the old format for those assets. Below are several possible solutions to supporting the legacy skins. These are only suggestions, as I do not have intimate knowledge of how Minecraft and the skin system works under the covers. What I propose here may be incorrect or not applicable to the system, but I hope it might at least give Mojang ideas on how to implement this request. Increase the "new" player skin size to be 64x64 pixels. Place my new format in the top half and leave the rest blank. Let the old skins stay as using the 64x32 size. There are several reasons for this approach. When the game client downloads the player skins, it can easily tell the difference in size. A 64x32 skin would use the traditional mapping we see today. Nothing changes and all the current skins out there are still ok to use. A 64x64 texture would signal the game to switch over to using the new format for that player. Since the game knows which player is using which skin, it can easily keep track of which format to use for who, and allow both types to co-exist at the same time. 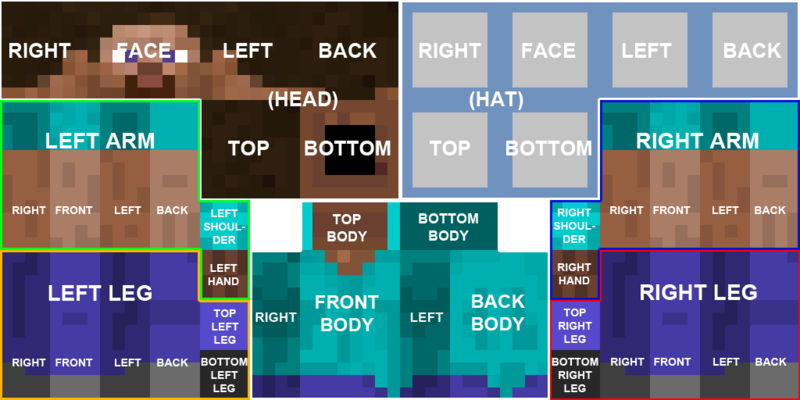 The extra space in the bottom half of the "new" skin can be used for future player character enhancements by Mojang, in case they decide to add more. As an example... if we ever get custom capes, perhaps the texture could be saved to the player skin and use the extra space here. The extra space in the bottom half of the "new" skin can also be used by mods! Any mods that had additions to the player model could use these areas. And there would be a lot more space now! One major drawback to this approach is that the larger image file size could adversely affect the skin servers that Mojang use. If it proves undesirable to alter the skin file dimensions, another possible solution could be to have all new skins require metadata content added to them. Then, similar to solution A, the game would examine each skin file it downloads and search for the appropriate metadata flag. If it finds none, use the old formatting style on that skin's owning player. If it finds the appropriate metadata flag, use the new format for that player. One problem with this approach is that png files don't have a standard way of encoding metadata. So I imagine Mojang would need to create a small utility to "stamp" skins with the metadata flag they would expect to use. This would require some extra care for making new skins on the part of the community. But on the up side, this could pave the way for an easy versioning system for additional future skin formats. Another drawback would be the reduction in free space that some mods may have come to depend on. In this case, I believe the only solution would simply to have those mods not use the new style. They would have to require their users to say using the old skin format. So they wouldn't get the extra arm and leg, but the mods wouldn't break either. A fair trade off I think. v.5 - overhauled the main post. Scrapped conversion suggestion from v.3 and added new suggestion of metadata for differentiating old vs new formats. v.4 - 12w32a changes things! large rewrite of the suggestion. I originally thought all humanoid mobs + armor had to use the same format. This is no longer true. So using 64x64 player skins is possible without needing 64x64 versions for all other armors/mobs. v.3 - added ideas on converting old formats to new - so current skin repositories wouldn't be rendered obsolete. v.2 - updated mapping (as seen at top of page). -would need to update all existing skins/armors to the new mapping < Having a pip-boy! -new mapping is cramped, not as intuitive as the original < Having a pip-boy! -much of the minecraft community is resistant to change < You can't really make a suggestion without this happening... also Having a pip-boy! To counter difficulties such as it being harder to skin, Notch (or a third party) could simply make a program. Because programs solve everything. Also compressed the image. Adding two nice little spaces for shoulder pads or something. Checking already gives you 25% addiction. Honestly, the only part I would see as being "hard" to skin would be the left leg... but even then, not really. It's not like you would be forced to texture that part on its side from the start. Just make the texture as if it were not rotated, and then rotate the finished product into place. I like the idea, but move the Left Shoulder and Left Hand pair, and the Right Shoulder and Right Hand pair, over to the right and move the Right Leg's top and bottom into the new empty space created, so that it's adjacent to the rest of the Right Leg. move the Left Shoulder and Left Hand pair, and the Right Shoulder and Right Hand pair, over to the right and move the Right Leg's top and bottom into the new empty space created, so that it's adjacent to the rest of the Right Leg. Yes, this sounds like a great idea! I have these great ideas for skins with decorative armor and such, and now I can have different armor on both sides! Also, different arm textures = more realistic assassin's creed textures = win. The only actual bad part is the changing current skins to the new version, but this could be solved with an option (it's one of the few features I think could actually be optional). I'd love to have a gun strapped to my right arm, support here. Edit: While this thread is months old, I think it does hold some merit. So I stand by my post. This is a well thought out idea and stated very clearly. You have worked hard on this and it shows. I give my full support to this idea as it makes a lot of sense, is unique, and would be an absolutely wonderful addition to skins. Woooow, this was necro'd so hard. But it deserves to be. Great idea. I've always wanted a half-cyborg. Okay. I had an idea. On the profile page on Minecraft.net for skins, just have two buttons when you upload your skin file. Old Skin styles and New Skin styles. Eliminates the need for any conversion, old skins still work and all you need to do is take a quick look at the skin file before uploading it. This would actually make me consider changing from the default skin. I still wouldn't, but I would consider it briefly. I think someone sneezed and accidentally clicked the no option in your poll. There is no real reason not to like this idea. It would only take a little extra work but be worth much more as skins would be able to be slightly more unique. I like this idea, but I think a few adjustments need to be made. Instead of squeezing alternate arm and leg textures into the same size image, create a larger image and put in another arm and leg texture in the same format as it is currently. You now have two possible skin formats you can select from, the old one and this new one. Minecraft will automatically detect the size of the skin image you have and will apply the correct format by itself. People will not have to change their skins to the new format. Less messy skin image (no sideways legs). People will not have to use the new skin format ever. Since the new format uses a new size, minecraft won't get confused as to whether you are using the old or new format. Larger skin image file (one of the points of this thread was to not waste the existing space). I think this way will work better an be less controversial. If we expanded the image, could we add a spot for back ornamentation? Thanks for the suggestion! I did consider this when drafting the idea up, but decided against it... At the time, I was unsure if the player skin was created at some optimal size... and was unsure if making it bigger would have some negative impact on SMP. However, seeing as how the newer mobs created are using huge textures with a lot of unused space, (like the golem) perhaps it may be worthwhile to go back to that idea. As you pointed out it would eliminate the two flaws in my suggestion (split up/rotated leg and support for legacy skins). I will update this and put together a new skin template. Very cool suggestion, only problem I have with it is the layout. Wow, I think this an excellent suggestion, but I did vote for the "Yes, but only for both arms - I don't like the splitting/rotating of the left leg. " option though. My reasoning is that if you make the upgrade, make it simple or really go nuts. If you keep it simple, just add the extra arm and be done. But if you want to go nuts, then I think that we should consider completely redoing the character textures all together. I'd like to upgrade to a larger image for characters. This could not only let you do unique arm and legs, but also add more layering options. I see now that Black_Drath mentioned the same thing and I agree I can't imagine there's some technical reason for keeping player textures so small.